A true buffo, Adelmo Guidarelli was a hysterically funny Don Magnifico whose great aria "Miei rampolli femminini"
and various facets of Magnifico's not-so-glorious character while singing fast and loud. Of course, he won the drinking contest as well. 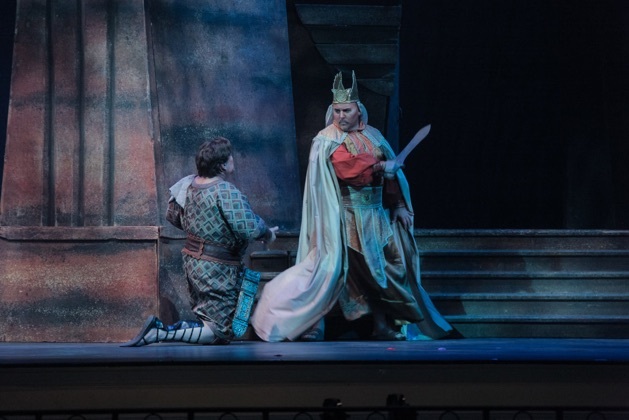 "As Morales/Zuniga, Adelmo Guidarelli delivered an attractive, full-bodied, powerhouse sound!" Adelmo Guidarelli, as his disgruntled servant Leporello, the source of most of the comic shtick, is a dynamo. As Don Magnifico, Adelmo Guidarelli is superb – bald and round, imperious and severe yet toadying and foolish, he cuts a marvelous figure. Don Magnifico was hilariously portrayed by bass-baritone Adelmo Guidarelli. 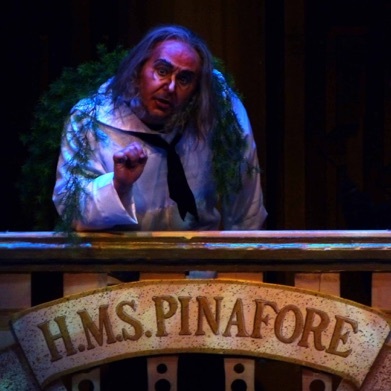 Adelmo Guidarelli brings a flexible voice and tremendous gusto to the role of the stepfather Don Magnifico. Comic impact was provided by Adelmo Guidarelli as the Innkeeper/Governor. Adelmo Guidarelli was charming as Parmenione's Schleporello-like valet, Martino. A veteran comedy performer, Mr. Guidarelli stole nearly every scene he was in. Adelmo Guidarelli’s entrance as the Sacristan at the beginning of Act I put the audience at ease immediately with his joviality, as he worked his way through the theater with a dust rag, wiping off the woodwork, creating the illusion that everyone was seated in an Italian church. His voice was both deep and powerful, cutting easily through the orchestra with a pleasing timbre. Baritone Adelmo Guidarelli was a first-rate Horace Tabor; not surprising, given that he’s one of the few opera singers who can lay claim to a MAC (Manhattan Association of Cabarets and Clubs) award for a cabaret show. You don’t get that without some theatre smarts. Guidarelli played the quick-witted Figaro with just the right balance of levelheadedness and tenderness. His deep, abounding voice was appropriately masculine and vigorous. Adelmo Guidarelli was an ideal Schicchi, singing and acting the part with relish and avoiding the excessive buffo posturing of even famous Schicchi’s of the past. The performance led by the great Maestro Anton Coppola, was an utter delight, the full house enjoyed the performance and bravos nearly hit the roof. Copyright © 2019 Adelmo Guidarelli.